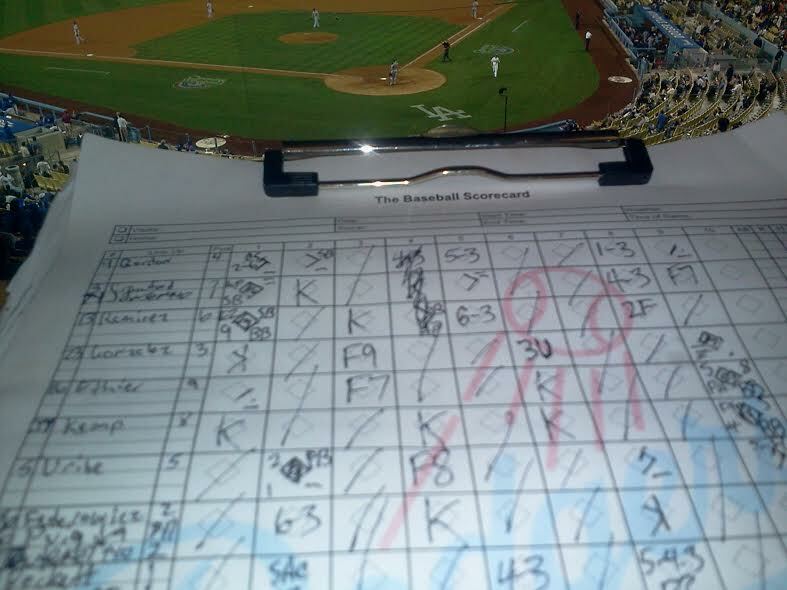 So I made it out to my first game of the season this past Wednesday to see the Dodgers do battle with the Tigers. Many, including me, are predicting these two will meet in this years Fall Classic and if these two games this past week are any indication, we may have just seen a 2014 World Series Preview , silly as it may sound being it’s only April . Sometime a little after 1st pitch just past 7:10. 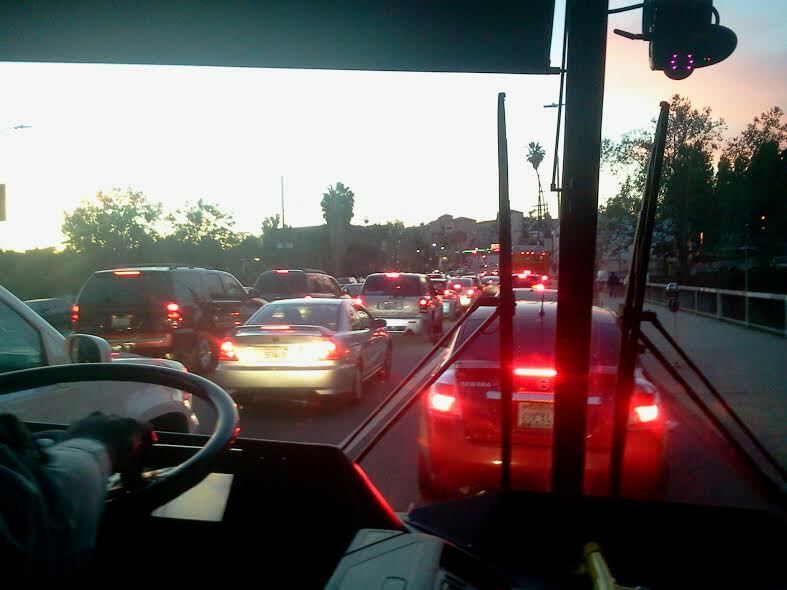 We decided to take the Dodger Stadium Express shuttle to the game after taking the Red Line from the North Hollywood station. Did I say express ? Sunset and Figueroa. Where the dedicated bus lane is supposed to begin. OK, why are there other vehicles in this “dedicated bus lane ” ? All right ! Now we’ve made progress. We’re now above the 100 Fwy !!! Sunset and Marion. We’re getting closer. Still, no signs of this “dedicated bus lane” . 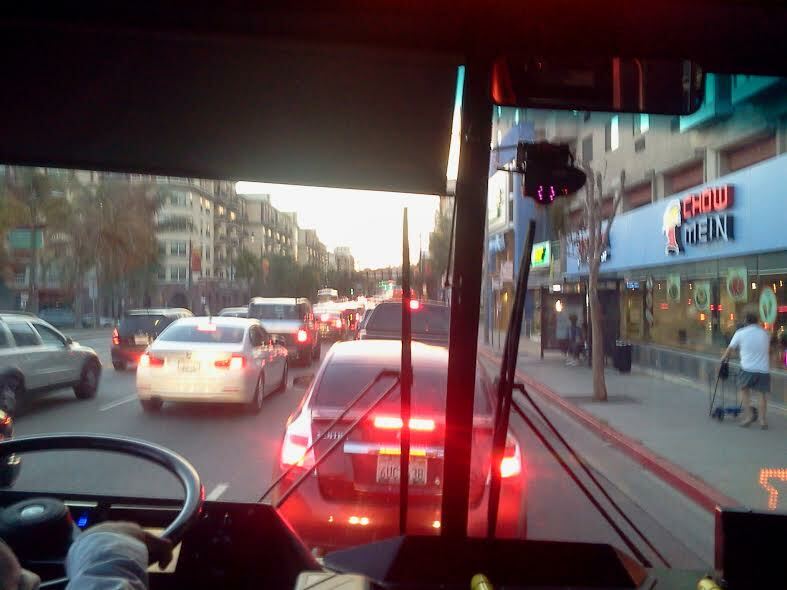 According to the MTA Website, you won’t have to fight traffic with this dedicated bus lane…. Ah Finally !!! 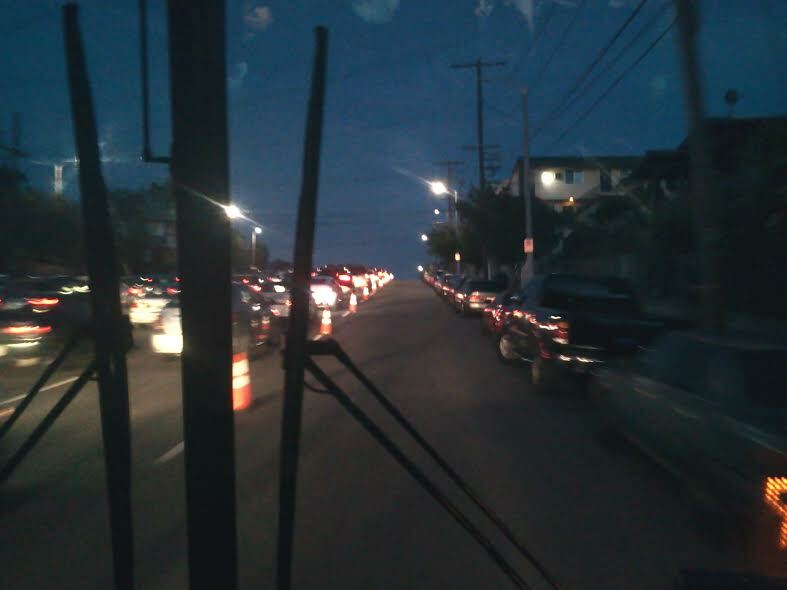 Our dedicated bus lane !!! 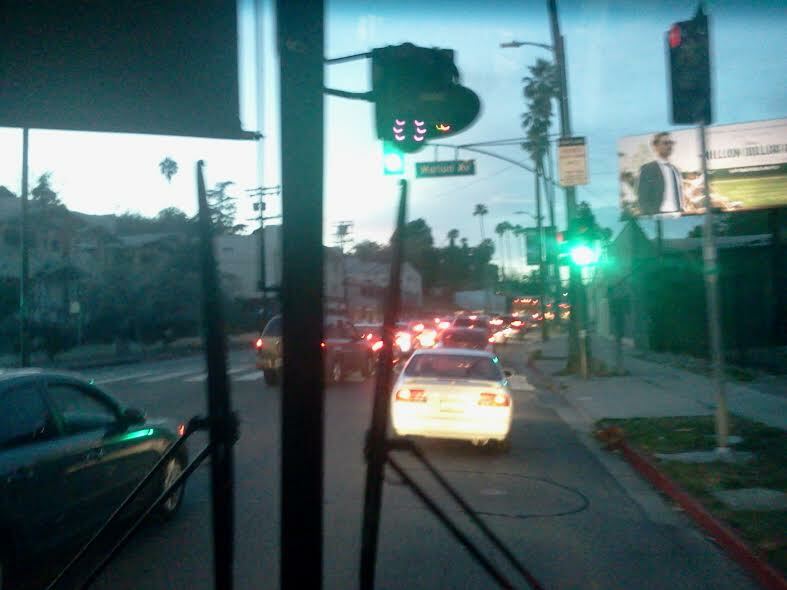 Just as we descended up Elysian Park Ave. So this lane lasted all but 2 minutes, if that !!! 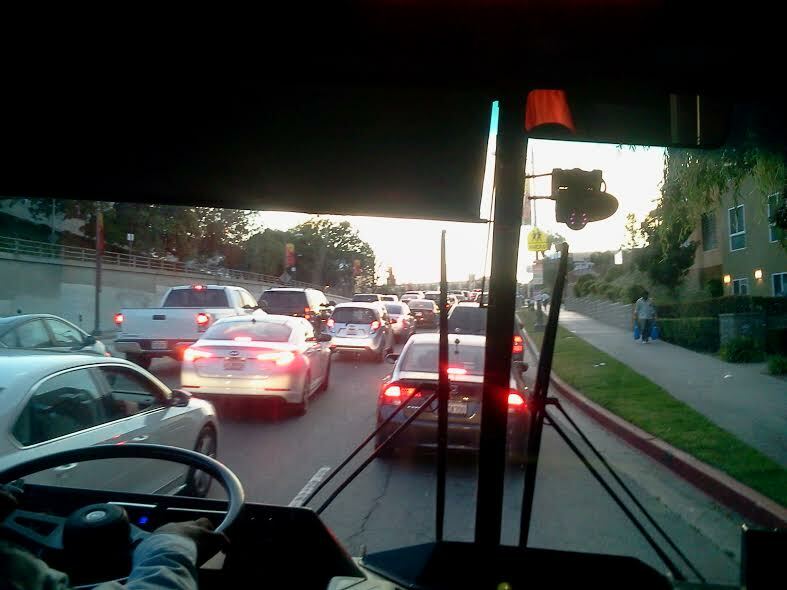 It’s a given that traffic is a 24/7 issue here in L.A. and yes, there’s a reason Dodgers fans have a reputation for always arriving late. Having said that, where we’re the traffic officers who we’re supposed to patrol this so-called stadium express lane ? Even our bus driver had questioned the presence of the so-called traffic cops, or lack of presence…. 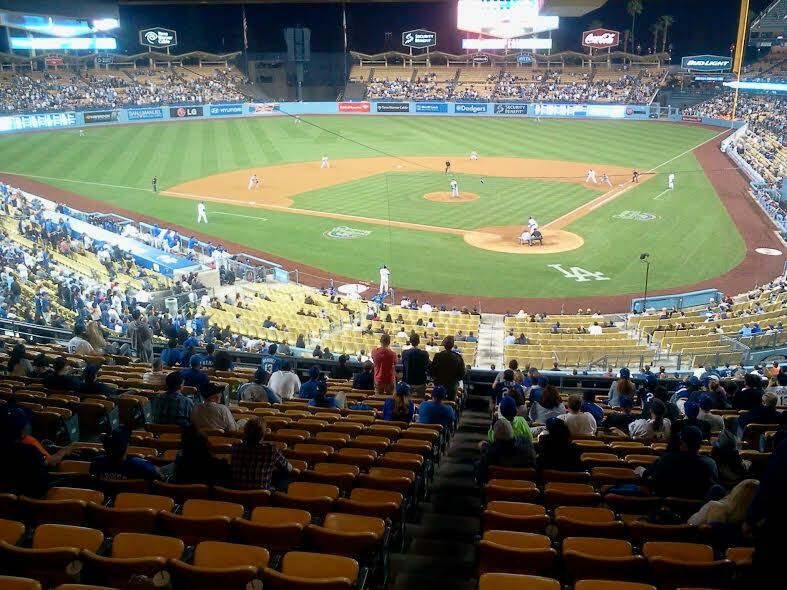 If this is any indication of things to come with larger attendance anticipated this season, my advice to you all particularly those coming out to Dodger Stadium for the first time and all you ballpark chasers…. Carpool. Drive as many of your buddies to the game as possible. If possible, head to the game at least 3 hours before game time if you want to be there for the first pitch. If you do plan to use the stadium shuttle from Union Station, do get there early if you can !! Based on Wednesday’s experience, the lack of traffic officers will pretty much defeat your purpose of using this express shuttle. 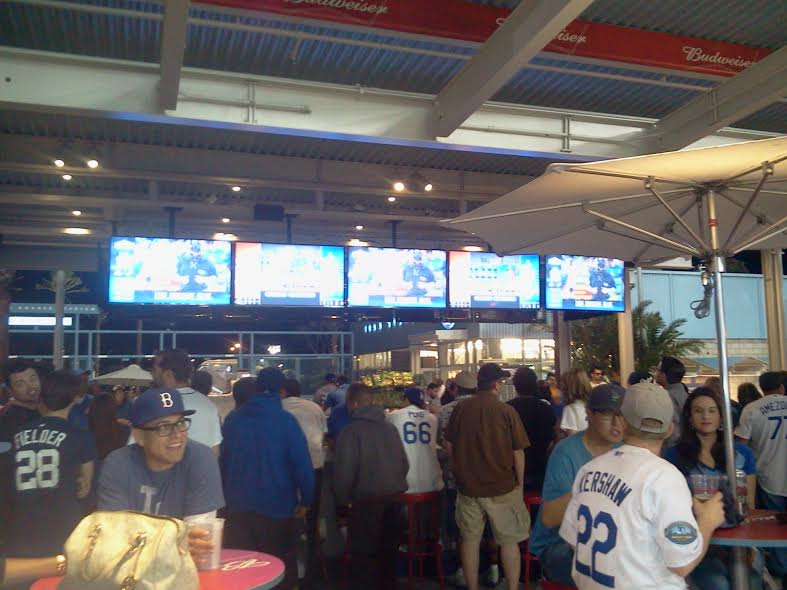 The bullpen bar, above the Dodger Bullpen. 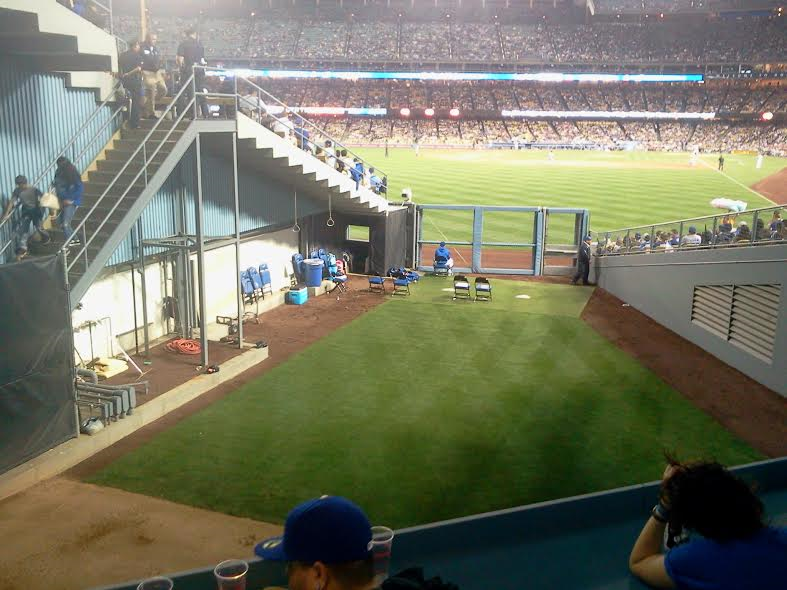 The Bullpen Overlook, above the Dodger bullpen. A great perspective to observe pitchers warming up. 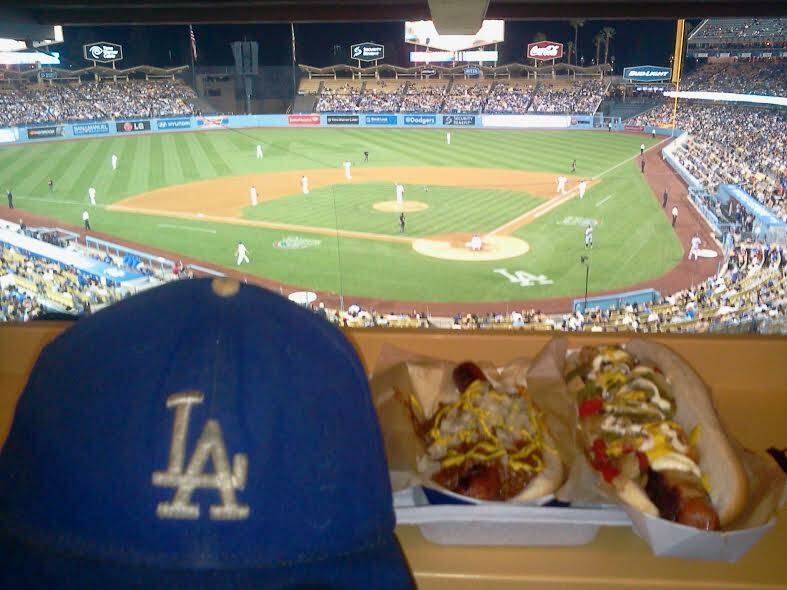 I wouldn’t spend 9 innings here though based on this view, and i’m sure neither would most fans. 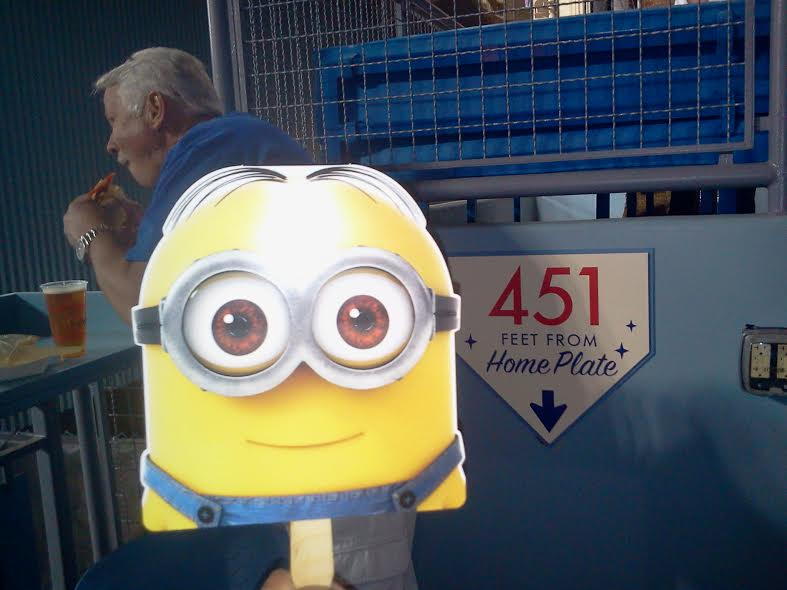 From the RF Bullpen Overlook, with our Minion !!! 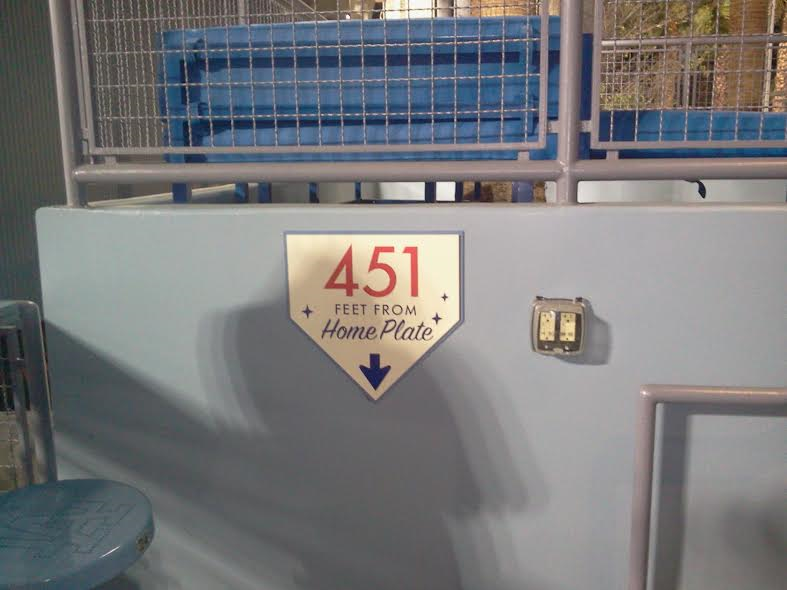 Only 451 ft from home plate . Oh yeah, another addition throughout the stadium this year are those outlets for your mobile devices, now that Dodger Stadium is equipped with WiFi, which was surprisingly strong during my Wednesday night visit. OK, now that we circled the entire stadium during the game, for the first time ever, here’s our view from the loge between third and home. 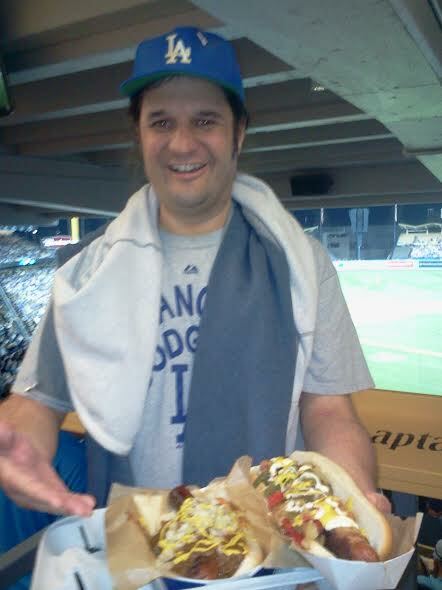 Tonight’s featured fan, Josh, master of voiceovers, from Eagle Rock. 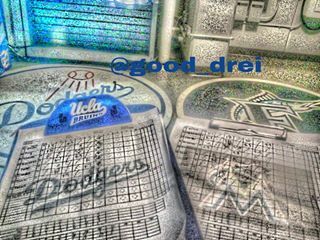 Josh and I have been attending Dodger games and other baseball games throughout the MLB since 1994. 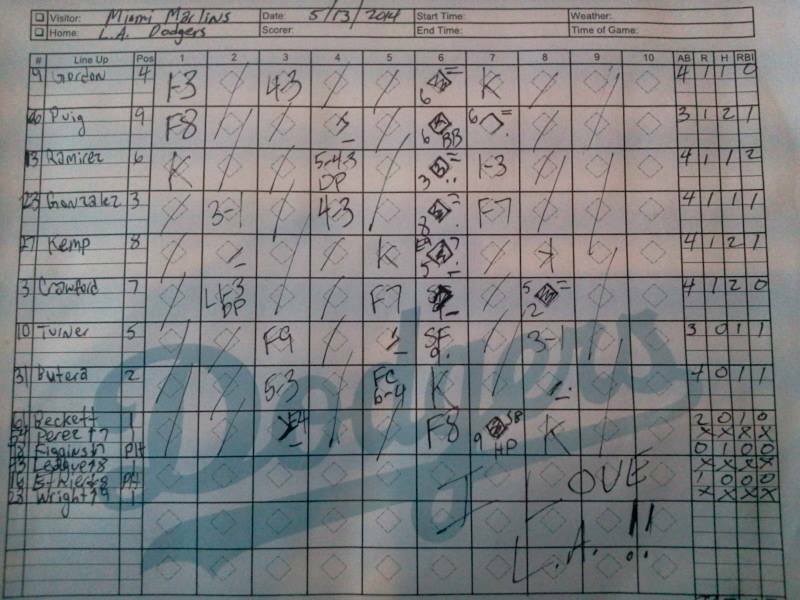 Our first Dodger game we witnessed in April 8, 1994 with Chan Ho Park making his debut in relief against the Braves. Kent Mercker of the Braves went on to pitch a no-hitter against the Blue, on the evening of the 20th anniversary of Hank Aaron’s 715th. No, Josh did not eat both those dogs !!! 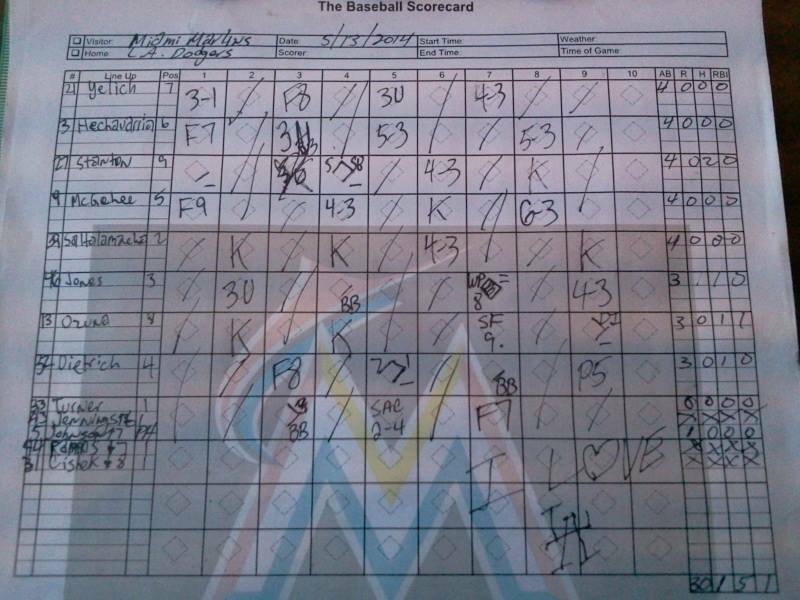 However, Kenley Jansen would surrender a solo shot to Victor Martinez and the Tigers would prevail in 10, 7-6, with the teams splitting this brief 2 game set, both games going extras with both teams staging 9th inning rally’s. Could this really be a preview of things to see come October ? 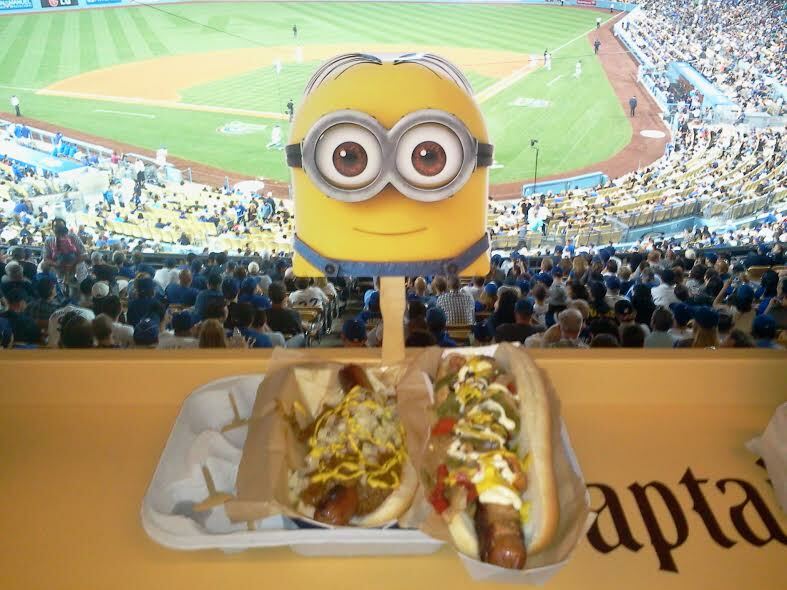 OK, 10 games into the season and like the rest of you, I’m having some minor concerns right now about Kenley Jansen. 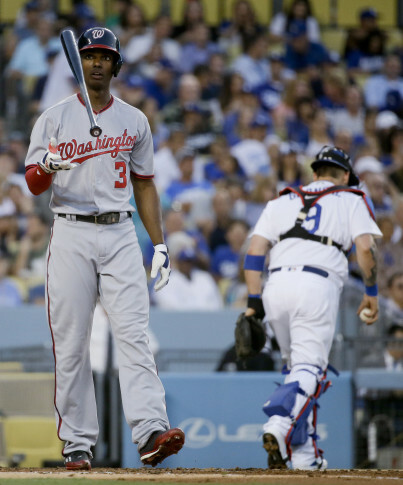 Like hitters who go through slumps, i’m hopeful that Jansen, who has struggled early this season as evidenced by the home runs allowed to Mark Trumbo in the Australia series and last night to Victor Martinez, as well as his bases loaded situation last week in San Diego which he was able to pitch out of, i’m hopeful that Jansen is just going through a slump of his own, and according to Mattingly, there really is no big concern over Jansen . 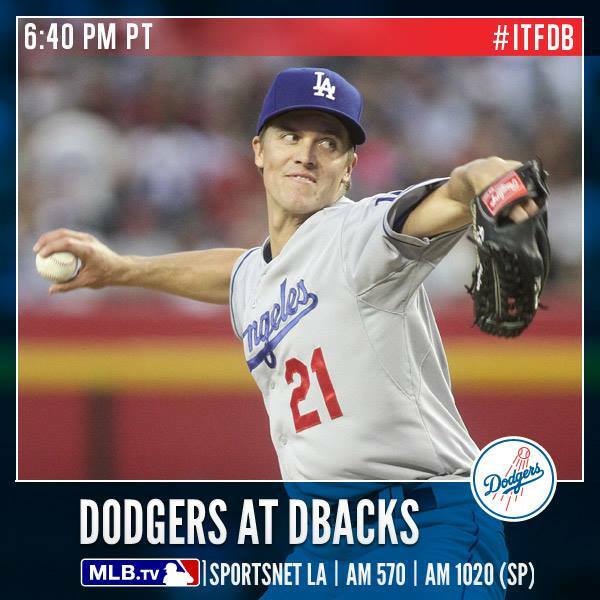 So now, the Dodgers head to Arizona for a 3 game set to start off the road trip. Arizona, struggling early in the season, is coming off a road trip of their own which concluded with the DBacks taking 2 of 3 in San Francisco. It’s still a long season folks….